The Squeezebox is an excellent digital-music device from Logitech that delivers what you want to hear. It offers good sound quality and a great variety of source options, from Internet radio stations, music services to podcasts and your personal digital music collection from local computer running the Logitech Media Server or a network-attached storage device. The Squeezebox enables you to stream music from almost popular music-streaming services such as Pandora, Napster, Last.fm and Sirius were also added. But if you are Apple Music subscribers and want to stream Apple Music songs to Squeezebox, things will get a lot more complicated. That's because Squeezebox does not support the Apple Music service. Why Can't Play Apple Music on Squeezebox Directly? The Squeezebox supports playing most major, non-DRM-encumbered formats`: FLAC, AIFF, WAV, Apple Lossless, WMA Standard, MP3, AAC/HE-AACv2, and HD-ACC. Here Apple Lossless is not for Apple Music tracks, but means iTunes Music in Default Location. Apple Music is a music streaming service developed by Apple Inc., and it only allows you to stream tracks for offline playing. Instead of owning the Apple Music songs, you can only use these songs within Music app on iPhone, iPad, iPod touch, Android phone, Apple TV, Mac and PC. What was worse, Apple Music songs are AAC audio formats encrypted with FairPlay DRM protection, which prevents you transferring them to external hard drive. Is it possible to play Apple Music songs on Squeezebox? The answer is positive. Because Squeezebox supports playing the audio files from the USB drive. So we need to remove DRM and convert Apple Music to the external drive supported audio formats, like MP3. 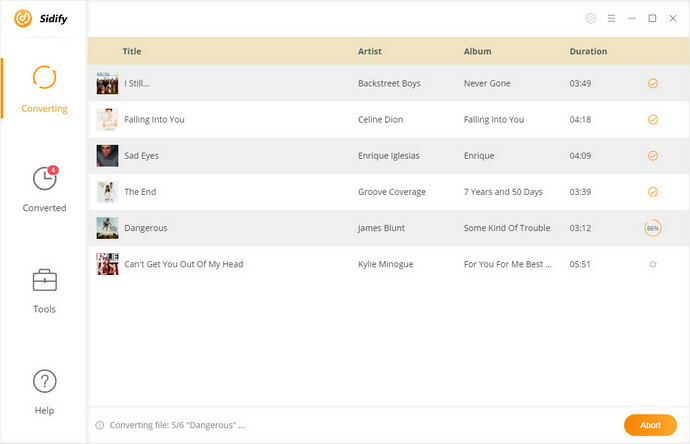 Sidify Apple Music Converter is such a powerful tool for you. With it, you can get rid of DRM from Apple Music songs by converting them to plain MP3, AAC, WAV and FLAC, so that you can stream the converted Apple Music songs to Squeezebox successfully. 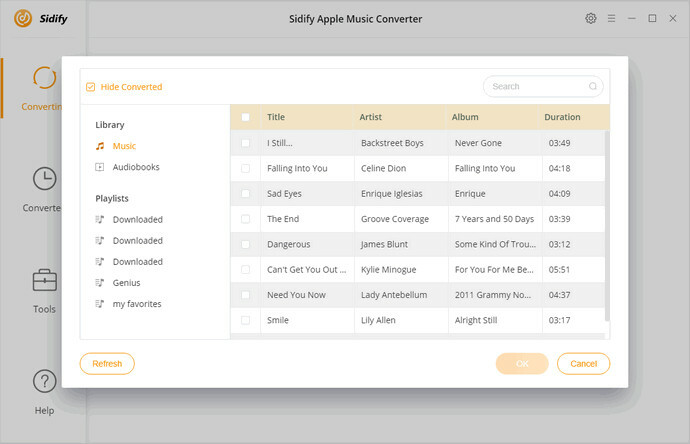 Why Sidify Apple Music Converter is recommended? Completely remove DRM from Apple Music songs, iTunes purchased music and audiobooks. 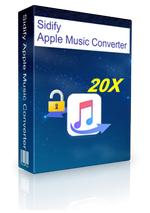 Convert Apple Music songs to MP3, AAC, FLAC or WAV with original quality kept. Stream Apple Music to PS4, Xbox One, Roku, Google Home, Amazon Echo, Apple TV, etc. Customize output parameters and up to 10X Conversion Speed. Fully compatible with the latest iTunes & Windows 10 & macOS 10.14 Mojave. Follow the step-by-step tutorial below to learn how to remove DRM and convert Apple Music songs to Squeezebox. Before started, make sure you have already downloaded and authorized the Apple Music songs on your iTunes. And then download and install Sidify Apple Music Converter on your computer. 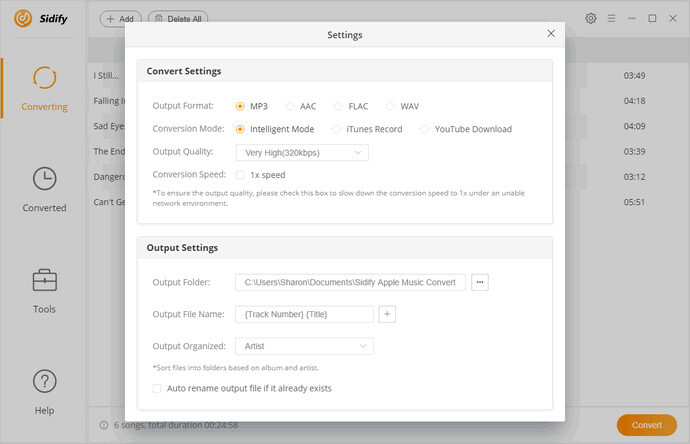 Launch Sidify Apple Music Converter and click + button to import the download Apple Music tracks to the program. Click Settings gear icon on the upper right of the main interface, and you can select Squeezebox compatible audio formats. Here we suggest you choose MP3, which is the most common audio format supported by most of the media player. Click Convert button, the program will start to remove DRM and convert Apple Music automatically. Once the conversion is completed, you will get the converted DRM-free Apple Music on the history folder. Then connect your USB drive to your computer, drag and drop these converted Apple Music songs to the external drive. 1. Attach the USB Drive to the connector on the back of Squeezebox, you will see a message stating that the device is being attached. 2. Tap the left arrow on your touchscreen to return to the Home menu. 4. From the My Music menu, select the converted Apple Music songs you want to play.